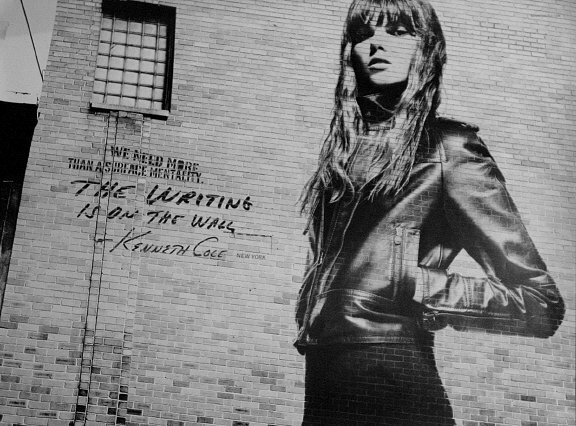 Kenneth Cole * THE WRITING IS ON THE WALL * Original Fashion Poster 3' ft x 4' ft 2007. Very Large Wall Size Measures exactly : 48" inches wide by 38" inches high. This Original Kenneth Cole Advertising Poster features a surreal graphic of a beautiful dark haired woman floating on the side of a gritty urban building wearing a leather jacket from Cole's 2007 Womens Fashion Collection. Kenneth Cole (b. March 23, 1954) is an American clothing designer. Born in Brooklyn, he is a graduate of Emory University. Kenneth Cole Productions, Inc. is an American fashion house founded in 1982 by Kenneth Cole.After establishing the Kenneth Cole name as a prime designer of women's shoes, Cole branched out into women's wear, menswear, accessories, and even jewelry. With his clothing described as "Prada for the people," he brought simple yet chic styles like black wool three-button suits, slick loafers and subtle ties to the workingman. Cole is also known for his socially conscious brand of marketing, as he often pairs clothing ads with charitable messages dealing with causes like AIDS and homelessness.The text on this high-contrast poster states : " We Need More Than A Surface Mentality . The Writing is On The Wall ". This large vivid poster is a Limited Edition Ad for Kenneth Cole's 2007 collection printed in Beautiful and Brilliant Razor-sharp Tri-Tone Black & White production on thick advertising poster stock. RARE , Authentic , Kenneth Cole Advertising Collectible - ready for framing , or just simply hang as is. Great for an Apartment or Fashion Studio , behind a Bar , Living Room , Den or Office. Will be carefully rolled into a heavy-duty tube and shipped Priority Mail with Delivery Confirmation / tracking .This Poster is in Mint Brand New Condition. Email with any questions before purchasing if you are unsure about something. We ONLY accept Money Orders , Cashiers Checks or U.S. Cash as payment ( we do NOT accept personal checks or online payment at all). Please email about local pick-up , we are located in NYC in Times Square. All International Customers MUST email us before purchasing this item.